Approximately 10 years ago when Paul Cavanagh and his partners relocated their Thai art foundry to Ayutthaya, Thailand, he first met Suparat Wanicha (Khun Nok). Khun Nok brought his own sculpture work to the foundry to be cast in bronze. Over time, Cavanagh came to realize that Nok is a very talented Thai sculptor who also has a very skilled team of workers. These employees are not only well versed in bronze sculpture but also know all the technical requirements of producing sculpture models. Paul Cavanagh readily uses Khun Nok and his team’s services to produce models and enlargements for The Paul King Foundry. He will be presented with a small model and Nok then produces a full sized model. This full sized model is usually many times larger than the original and can be made in any requested material: plaster, wax, plastilene, water clay – whatever the sculptor client requests. When the sculptor is finished working on the full scale model, negative molds are made and a hard model is produced for sand casting or a rubber mold is made if the lost wax process is to be used. This relationship works very well because of Khun Nok’s knowledge and skill. The Paul King Foundry is able to use the process for many clients. The Paul King Foundry works with Robert Shure from Skylight Studios in Boston who designed and made small models of memorials for Matthews Corporation. The Paul King Foundry then produced many large monuments in Thailand for Matthews Corporation and they were placed in many locations throughout the US and Canada. Additionally, the Paul King Foundry and Skylight Studios worked with a local RI businessman who lost his son at a very young age. The businessman wanted a bronze memorial made for his child. Shure made a small model for the family based on another memorial that had originally been made in Italy. Nok made a beautiful and faithful enlargement of Robert Shure’s model. Khun Nok also worked directly with Boston sculptor Laura Baring-Gould and assisted her in making the enlargement of her Boston monument. Nok also helped her solve some technical issues as well. He was involved with the enlargement of a large bronze figure for an architect from CT which ultimately became part of the structure of a building in CT. Khun Nok worked with Karen Petersen from VT, Chinese/Canadian sculptor Chong Fa Chong, Kumari Nahappan from Singapore – making enlargements and molds for them. Nok is skilled at mold-making and is a specialist in enlarging. 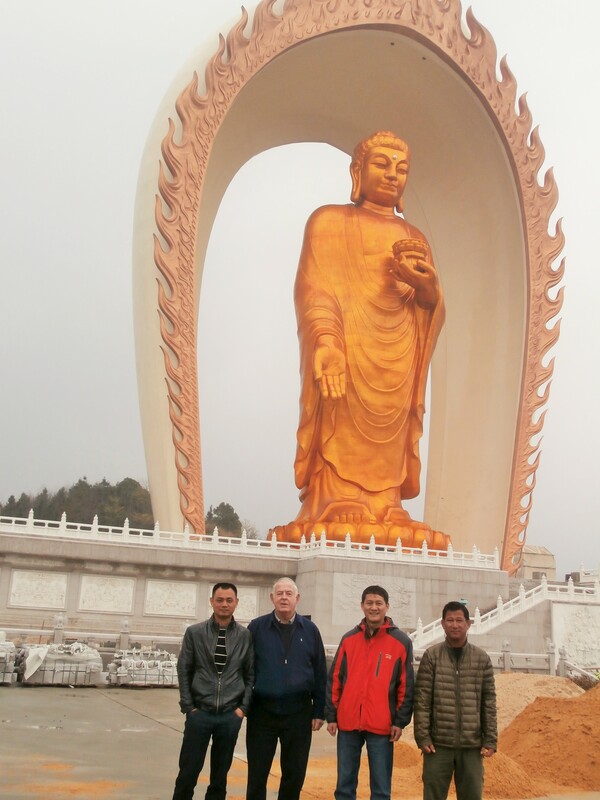 Nok is involved with numerous enlargements of monumental sized Buddha of up to 300 feet. Khun Nok has also become a specialist in fine finishing. He spent a month visiting the Paul King Foundry five years ago. Nok insisted on spending all of his time in the fine finishing department at the foundry in Johnston, RI and learning from our experts during that time. Khun Nok studied formally at The Art Institute of Chang Rai, Thailand. Nok works very closely with National Thai Treasure Artist Professor Nantiwat of Silapakorn University who studied with Henry Moore. Khun Nok is bilingual in Thai and English while also speaking Mandarin (Chinese). Paul Cavanagh and Khun Nok are currently working together on projects in China and Thailand. They are also involved with some public art projects in China. Nok is also the technical manager for quality control when Paul Cavanagh is not at the foundry in Nanchang, China. For more information about our Asian affiliate please visit our sister site Sculpture Source Asia.